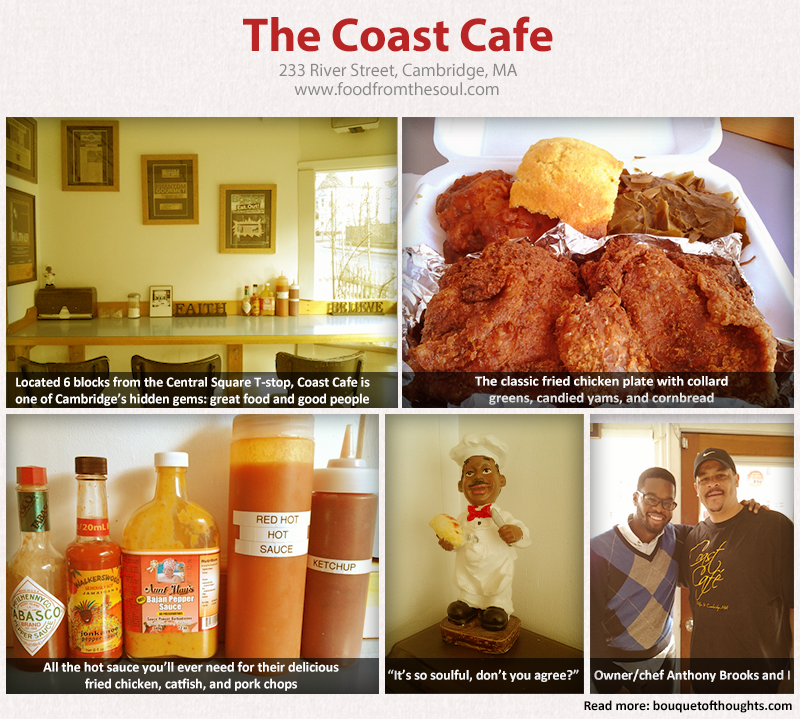 “Boston is known for having tons of great soul food spots,” said no one ever. When I first moved here for college, I distinctly remember the disappointing realization that I was going to have very few options for authentic, homemade soul food. After several experiences at Harvard student organization events with Red Bones, a place which does a decent job of masquerading as a soul food spot, I was even hungrier for the real thing. How could I have been so lost? What dark haze of ignorance and complacency had kept this gem from my sight? Within hours of reading the email, I was on my way over with a few roommates, eager to cast our eyes upon this legend. After that day, Coast Cafe became a part of the weekend activity canon. Do some reading, grab a haircut, destroy the fried chicken plate. Sweet candied yams, wholesome collard greens, cozy mac and cheese, and chicken wings fried to perfection. Rinse. Repeat. I’m back in Cambridge and supposedly wizened beyond my years. However, caught in the hustle of work and moving around the city, I’ve missed something. It’s not until January, when I’m looking through a “Best Of Boston” list, that I realize something is amiss. Some misguided heathen had declared the #1 soul food spot to be something other than Coast Cafe! The next day, I cleansed myself of the transgression of omission and finally grabbed a fried chicken plate with candied yams, collard greens, and corn bread. The food was even better than I remembered. I encourage everyone in the Boston/Cambridge region to please visit this place! Owner and chef Anthony Brooks and his staff have built an institution of great homemade southern food (against all odds in a place like Boston), and you absolutely must sample it. They also cater and have great lunch specials! It’s a tiny place just a few blocks away from the Central Square T-stop, but with its great food and good people, Coast Cafe truly embodies the definition of a hidden gem.